All the fun I used to have as a child at Halloween has now morphed into a delightful experience when doing a Halloween layout. The adorable AUTHENTIQUE "Glowing" patterned paper collection was a treat to work with! 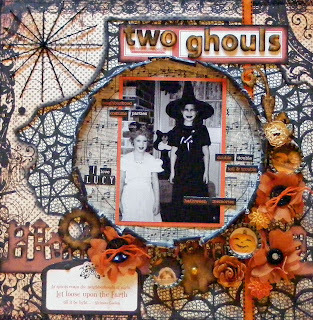 The title, "Two Ghouls" uses MAYA ROAD'S "Jonathan Mini Alphabet" chipboard, RANGER/TIM HOLTZ Distressed Crackle Paint (Spiced Marmalade) and STAYZON INK (Jet Black). If you haven't tried the Cut-N-Dry Stamp Pad Foam, also by Ranger/Tim Holtz, I highly recommend that you invest in a sheet. It is well worth the money, makes inking easier, more controllable, and seems to last forever! Check out the Tim Holtz Alterations "Townscape" that made a creepy looking neighborhood for this layout! Embelishments used include, MAYA ROAD's Organza Mum Trim (Pumpkin) and Ruffle Blossoms (gold and turquoise), PRIMA Cabachon Sculpture Resin Flowers by Donna Downey. 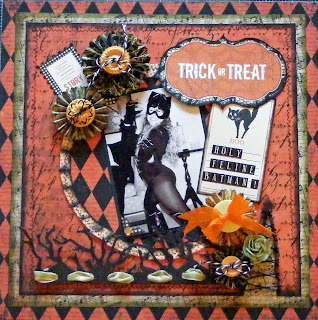 Also, notice the Grunge Board Elements flourish "Harlequin" by Tim Holtz and Authentique's Dictation and October Afternoon's Mini Market Stickers (Black & Cream). The little bottle caps are by Spare Parts and the black buttons are by Jenni Bowlin. After placing the picture inside a bottlecap I poured Crackle Accents by Ranger over the tiny picture, and let it dry for a few hours. The potter kneads, throws and molds the clay to make it into something it wasn't before he laid his hands on it. That is the way I think of paper. I like to work it in ways that make the piece interesting and give it texture. I am always thinking of ways to "mold" the paper into something that it wasn't before I touched it. In this layout I tore, fussy cut, rolled, inked, painted hand stitched and machine stitched the paper. 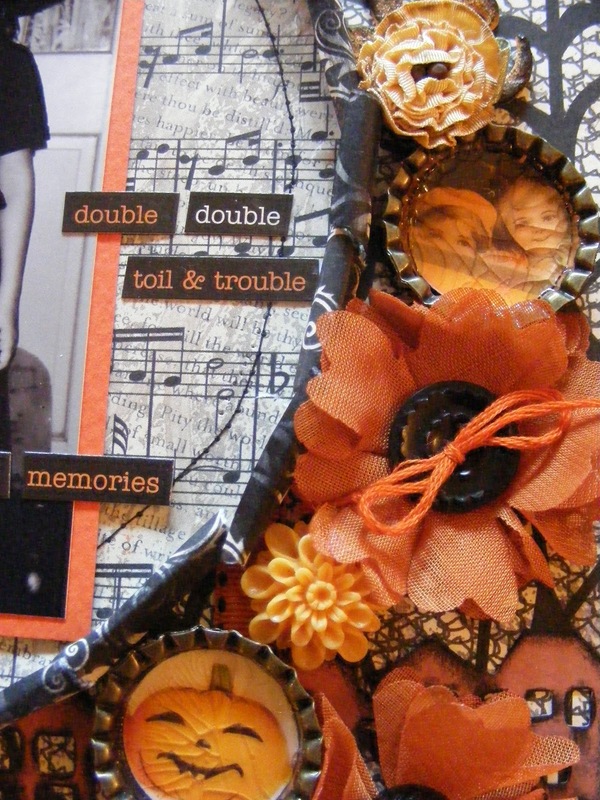 Thanks for taking a peek at this Halloween layout! You can view more of Patty's work HERE. Hope we see you soon at The Crafty Scrapper! 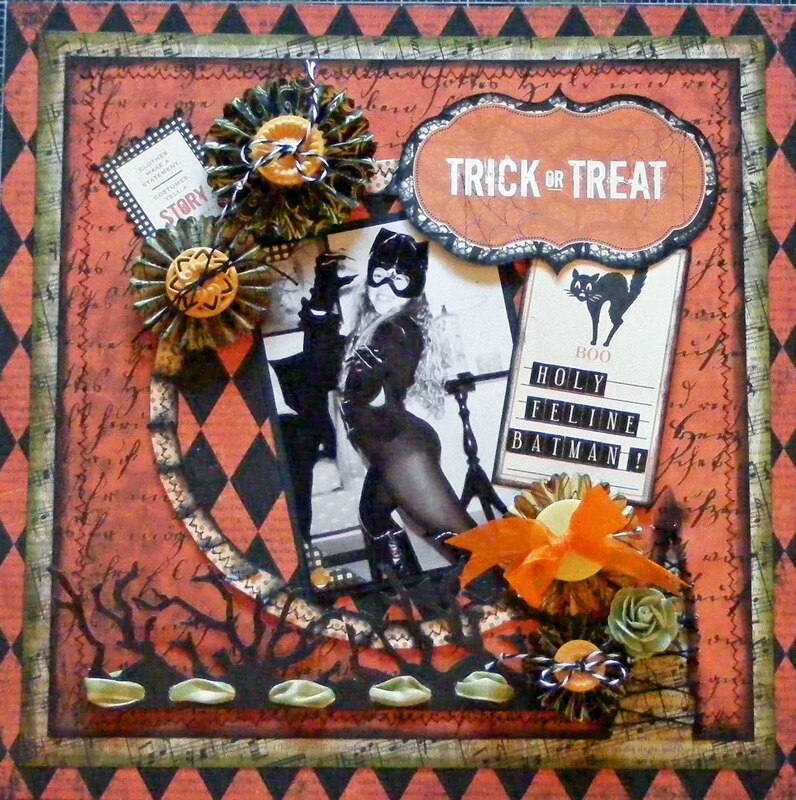 This is a layout that I did for THE CRAFTY SCRAPPER Design Team....What a "treat" it was to work with the AUTHENTIQUE "Glowing" collection! The colors are bold and true to Halloween tradition. I added a hint of green to the LO for a splash of gooey grunginess! 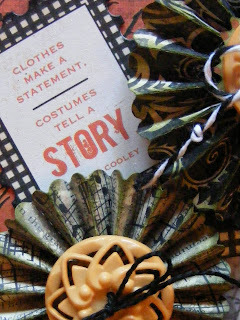 The paper is easy to punch and run through my CUDDLE BUG, along with the TIM HOLTZ/SIZZIX Alterations "Twigs", "Paper Rosettes" and "Mini Paper Rosettes". The title and story tag are also by AUTHENTIQUE. The "BOO!" tag is part of the lovely "Halloween 2011" collection by JENNI BOWLIN. Other products used are Jenni Bowlin "Vintage Buttons" (orange), STAZ ON ink (Jet Black), RANGER/TIM HOLTZ Distress Ink (Peeled Paint), and last.... but NEVER LEAST is a sweet little green PRIMA "Avon Rose". 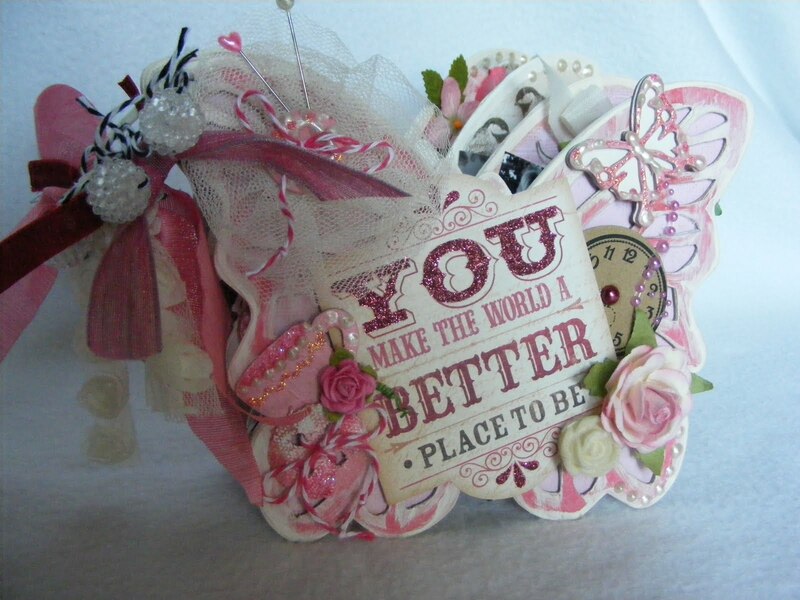 Some paper altering techniques used in this layout are tearing, punching, folding, inking, die cuting, hand stitching and machine stitching. The sweet little girl in the photo is my darling daughter, Elizabeth....when she was eight years old. Thanks for looking! 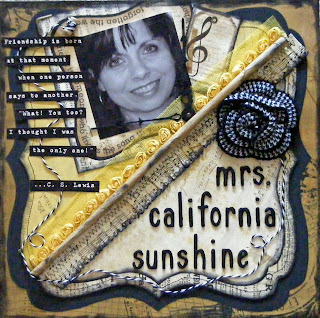 You can see more of Patty's work HERE, and you can get all of these supplies at The Crafty Scrapper! It's all perfectly stunning Sonia. Thanks for sharing. To see more of Sonia's art check out her BLOG. Papers and accessories by My Mind's Eye from their Mischievous line. Ribbon - The Crafty Scrapper Ribbon Wall. All these supplies, and more can be found at The Crafty Scrapper. Hope to see you soon! Here's another dark and lovely layout by artist Sonia Doneghue. You can see a tutorial on creating this zipper flower HERE. You can see more of Sonia's art on her BLOG. 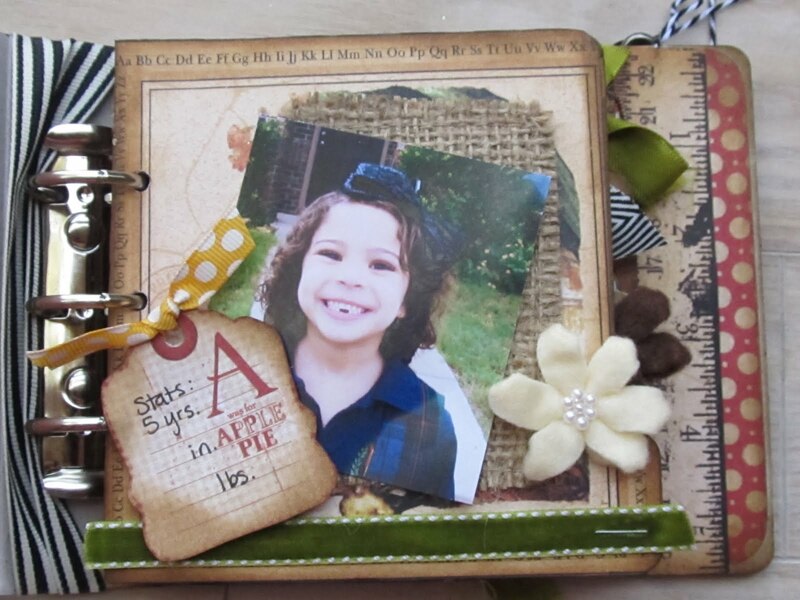 You can see this layout and more at The Crafty Scrapper! Hope to see you soon! 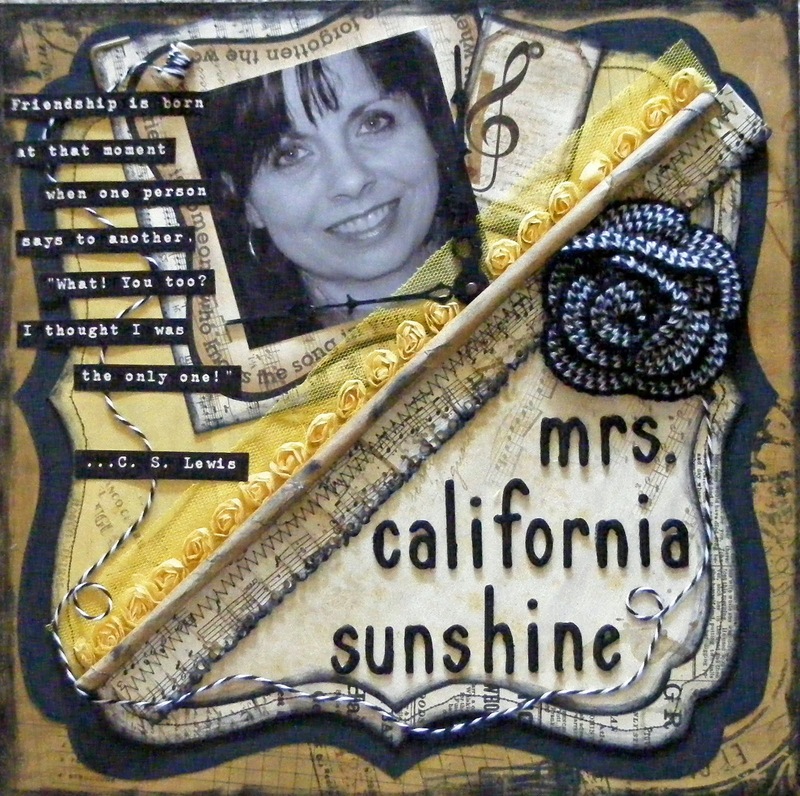 The layout is in honor of a wonderful friend of mine who lives in California. We have so very much in common, and although we've never met in person, we are sisters of the heart! Scrapbooking brought us together! Techniques used in this layout are paper punching, rolling, pleating, inking and machine stitching. You can see more of Patty's work on her BLOG. Embellishments - Maya Road: Small Organza Roses Ribbon, Noah Mini Alphabet, Winter Roses Houndstooth Licorice flower, and Mini Spool. You can see this layout and much more in person at The Crafty Scrapper! 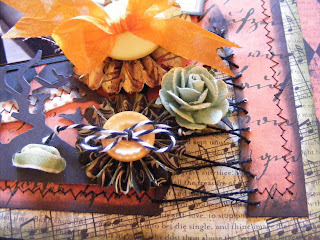 Do you love Tim Holtz's style, but don't know how to translate that into a 12x12 layout? Do you love inky layered goodness? Are you the queen of Halloween with a flair for the mysterious and dark? You're going to love the work of visual artist and design team member Sonia Doneghue. Sonia creates a stunning layout about the loss of her sweet dog using a few layered embellishments, and a simple but lush color palette. The handwritten journaling and the detailing on the mini-banner are simply fabulous. Hope this inspires you with new scrapbooking topics, and how to use all those embellishments you've been storing up. You can see more of Sonia's art HERE. All these and more can be found at The Crafty Scrapper. Hope to see you soon! Are you ready to swoon? 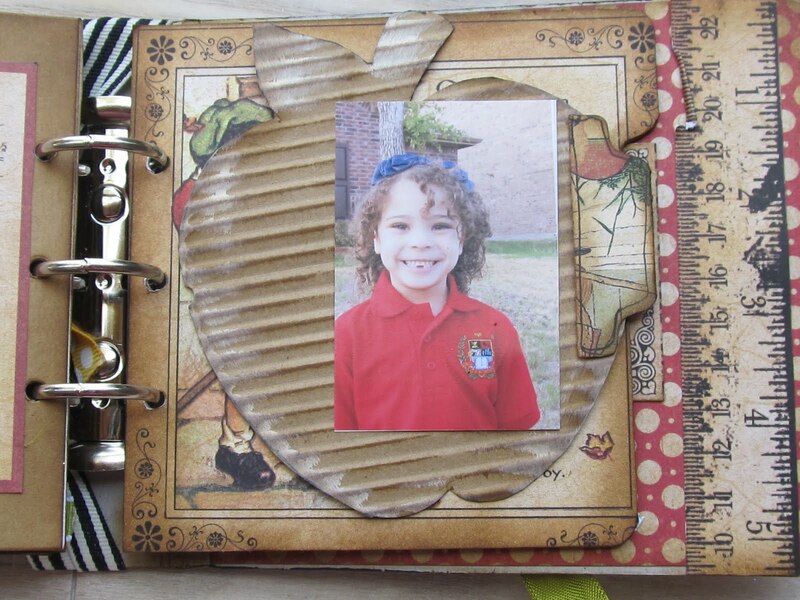 Check out this adorable mini-album and description by design team artist Patty Rogers. 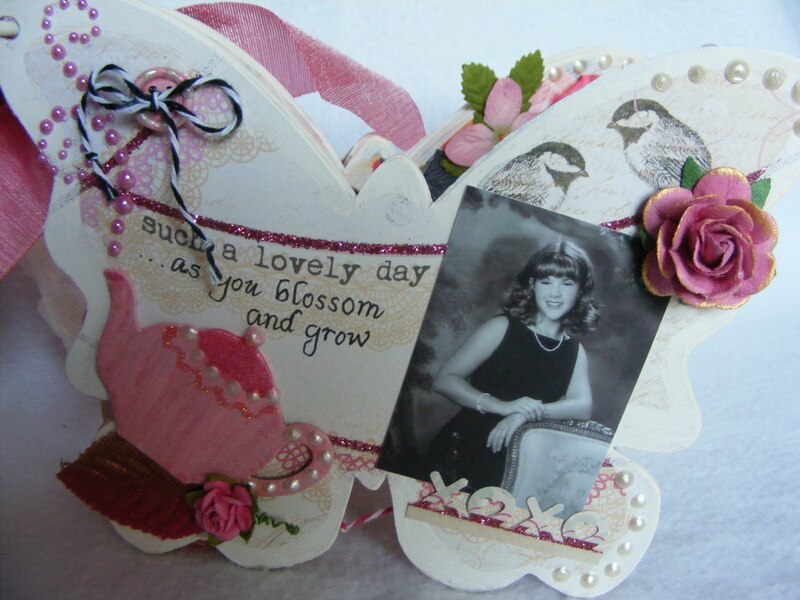 This "Soar Butterfly Chipboard Album" by MAYA ROAD was such a joy to create. The AUTHENTIQUE "Uncommon Collection" with a bit of MY MIND'S EYE "Lost & Found Two" were the perfect blend of papers. 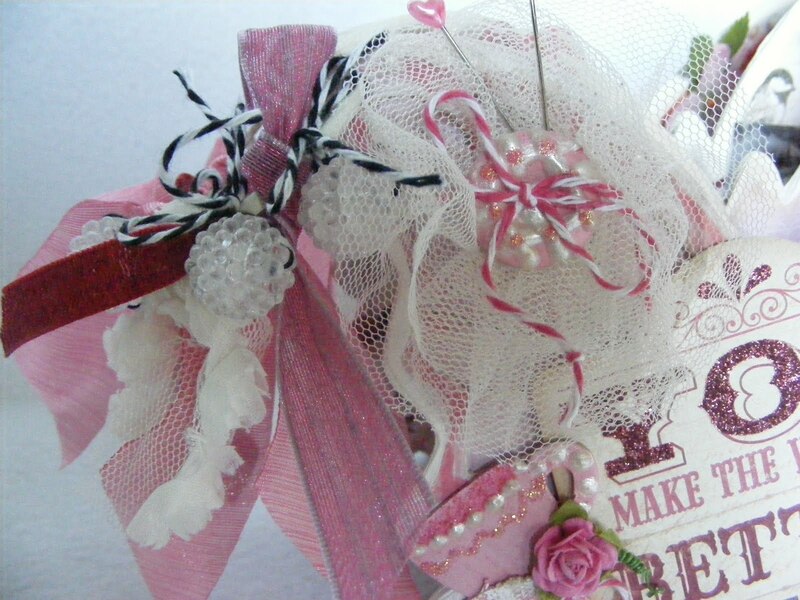 Look at the new "Gramma's Doilies" by Maya Road! Also used in this mini album are the following paints: Craftsmart Acrylic Paint (white) Making Memories (Strawberries and Cream),Tattered Angels Glam (Lipstick Pink) Viva Pearl Pen (Cream) and last but never least.....Stickles (Icicle)! The "Sweet Pearls" are by My Mind's Eye, and they are part of the "Lost and Found 2" collection. 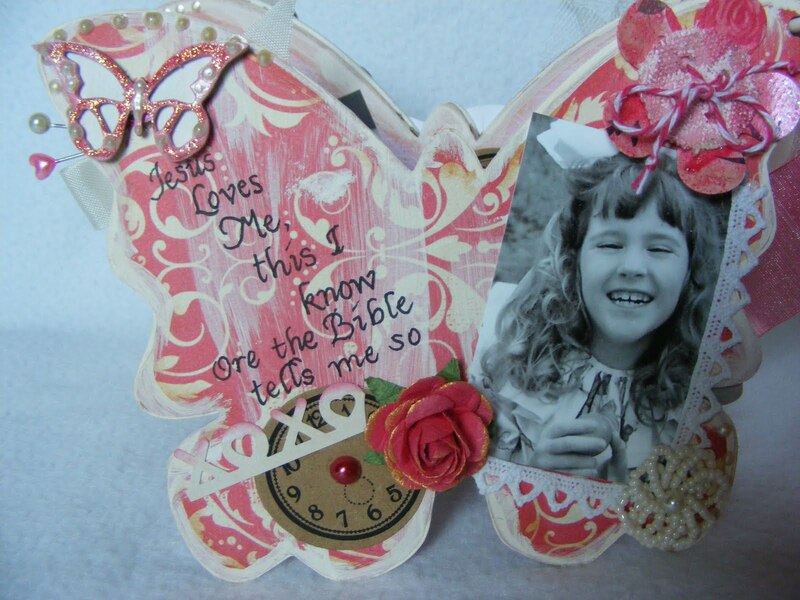 Check out the brand new "Coffee or Tea Mini Chipboard Set" and the "Butterfly Chipboard Set"! They were great to paint....very girly! 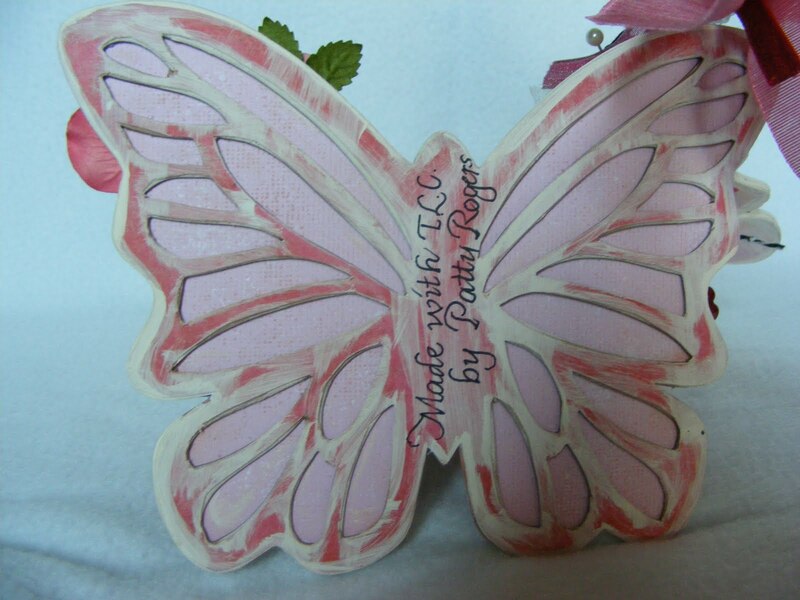 Each of the little chipboard butterflies consists of two pieces....I used the solid butterfly as a back and the cutwork butterfly on top of the other. The XOXO border punch is by Martha Stewart and it seemed PERFECT for this project. It wouldn't be an album by Patty without lots of Prima Flowers! 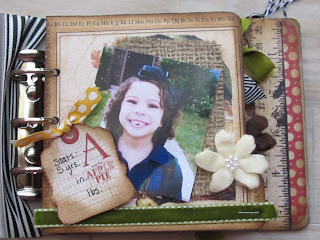 You can check out more of Patty's work on her BLOG, and you can see this album in person at The Crafty Scrapper. Hope to see you soon! Are you ready to ring in Halloween with longer nights and fun decorations? 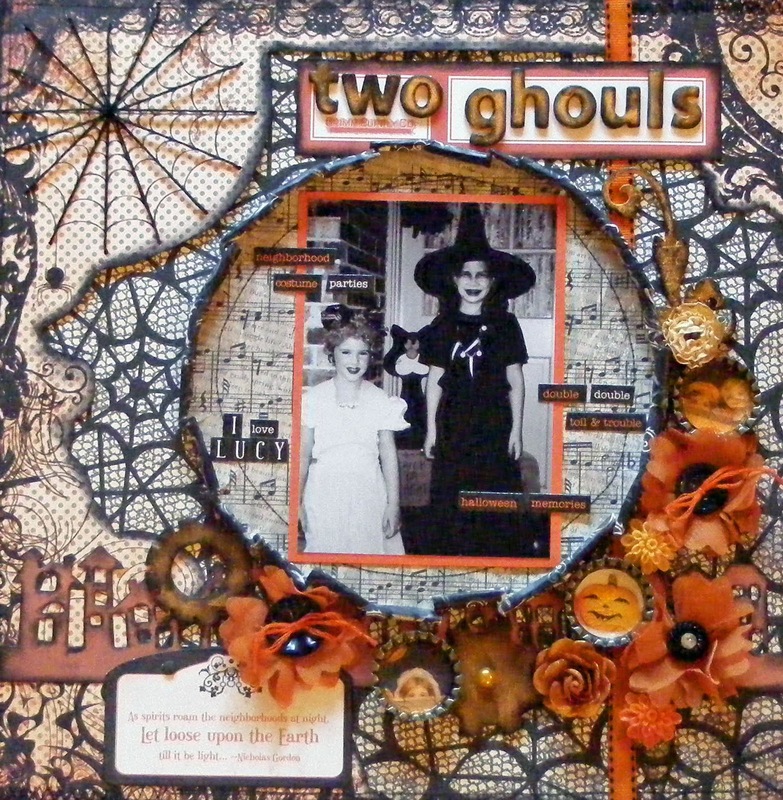 Check out these fun new Halloween classes at The Crafty Scrapper! 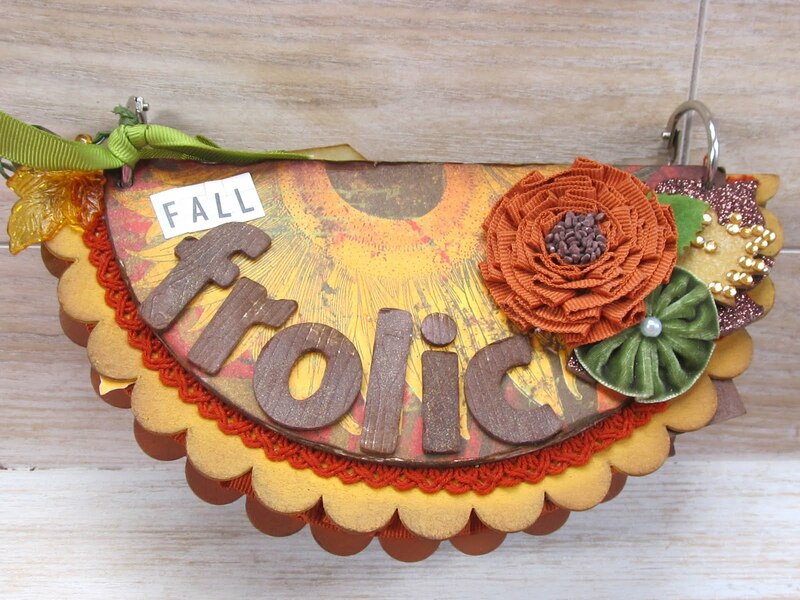 Join me to create this beautiful fall banner perfect for your mantle or door to display your favorite fall photos. You can check out more of her work on her BLOG. Later the same day you can check out this class with Shelley! In this class, we'll make this fun "Ghoul Bus" for your Halloween photos! 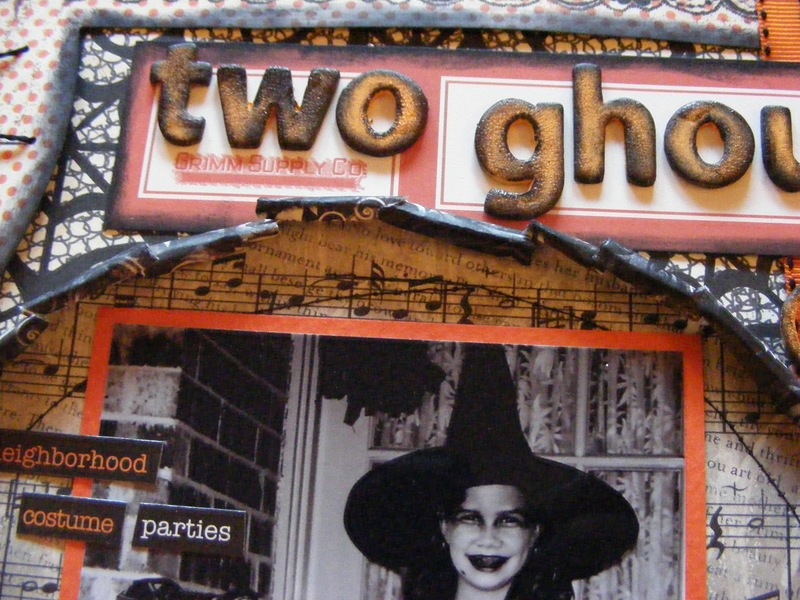 The front of the album has removable peek-a-boo windows with spooky messages underneath. Be sure to bring your Basic Supply Kit, Glossy Accents, paper piercer, and Zip Dry. You can check out more of her work HERE! Are you looking for an art class that will let you be fun, creative, and artistically free? Try one of Jennifer's canvas classes at The Crafty Scrapper! Please join her to make this beautiful 10 x 10 mixed media canvas and learn some new techniques using several mediums, such as Maya Road mist, rub-ons, paper, etc. You will leave with a completed canvas that is just your style to display in your home or give as a gift to someone special. Additional Supplies Needed: Paper Trimmer,Black Staz-On Ink, 3 to 4 bristle paint brushes, and any additional stamps and rub-ons you would like to use. Jennifer will supply several stamps and a variety of rub-ons for you to use in class. 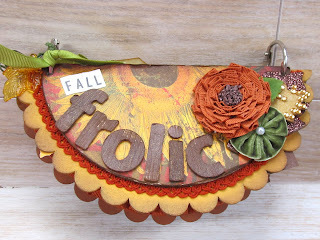 You can check out more of our classes HERE, and you can see more of Jennifer's work on her BLOG. Hope to see you soon! 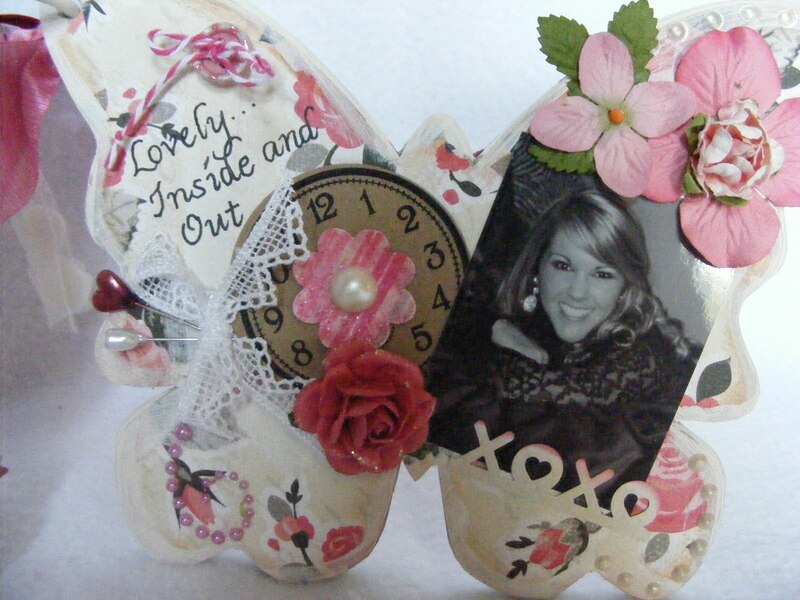 Here are a few customer creations from our FB fans. 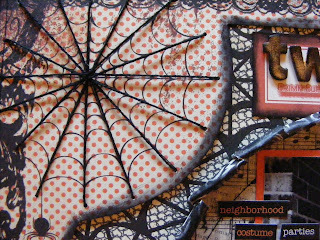 The first is a wicked Halloween layout "25 Cent Broom Ride" from Karen D. Brooks using some of the new Halloween papers available from The Crafty Scrapper. The second is an altered piece by Caitlyn D. Russell. She says "My husband is in Iraq and I saw the quote about "home is where his boots are" and the new Bo Bunny "Welcome Home" line worked out perfect for it." Very sweet ladies! Thanks for sharing! You can find these supplies and more at The Crafty Scrapper! Hope to see you soon. Are you interested in learning new stamping and card techniques? Take on of our classes with instructor Tina Covington from Live, Love, & Stamp. Here is a sneak of her upcoming class Pumpkins and Cauldrons! You can take this class on Wed. September 21st 11 a.m. or on September 24th 2:30 p.m. The cost is $25. Pumpkins & Caldrons - In this class you will get to use the brand new Honey Pop stamp sets for the upcoming Halloween and Thanksgiving holidays. You will complete three very creative and unique cards, including two cards with the honeycomb pop-ups, and a criss, cross pocket card using a darling pumpkin stamp from My Favorite Things. Please bring adhesive, small pop-dots, an X by Xyron (if you have one), a glue stick, detailed scissors, and your preferred coloring medium (Copics, colored Pencils, etc.) All other supplies provided. My daughter started kindergarten last month. It was a big event for our family. I am a stay-at-home mom so I felt keenly that I needed to record this big change. To go along with some of the pictures I've been taking I made this kindergarten mini-album to record some stats from the beginning of the year. I used Graphic 45's ABC Primer papers. I just loved the vintage look. I think it goes nicely with the plaid from her school uniforms. I recorded her height and weight to add into the album as well as info about her teacher and friends. 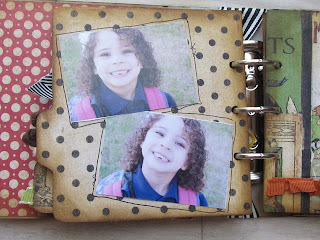 If you need a mini school album I will be teaching this as a class at The Crafty Scrapper on September 24th at 10:30 am, or you can call the store to reserve a kit 972 923 3151. :) Cost is $32. 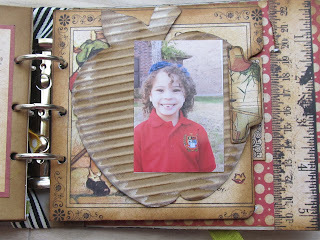 Check out what design team member Jennifer did with her Smashbook she picked up at The Crafty Scrapper. You can see more photos on her blog HERE. The cooler temps are finally ushering in fall, and I couldn't be happier. It's still 90 degrees, but so much better than 110! :) Here is a sweet mini album I made with BoBunny's Forever Fall collection to show off pictures of the kids at the pumpkin patch last year. I know it is a bit early, but I am already eager for the leaves to turn, the days to shorten, and the nights to drag out into a cozy scene around the fireplace. I will be teaching how to put together this album at The Crafty Scrapper on October 15th at 10am, or you can call the store (972-923-3151) to reserve a kit. The cost is $35. 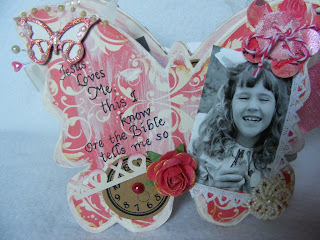 This is another layout I did for The Crafty Scrapper Design Team www.thecraftyscrapper.com . I had enough papers left over that I decided to do this layout of my great grandfather Henry Preston Amsden. He was born in 1881 and died 2 weeks after I got married in 1970. He was such a very gentle and kind person. He was also the towns blacksmith and he made the wagon he is pulling. They were one of the first people to live in Whitehouse, Texas. 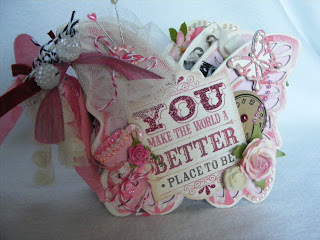 This layout is one that I did for The Crafty Scrapper Design Team. My friend Patty picked the papers, etc. up for me while I was on vacation. It took me a week to figure out exactly what I needed to do. The papers are from Bo Bunny and it had a very heritage feel to them. So, I finally thought of my grandmother Louise. I love her photo of when she was 9 and then I decided to had a photo of her today at age 99. Hince the title "Time Traveler". Since she is 99 she has seen so much in her lifetime that I thought it would be a perfect title. I cut out the second paper and distressed it and then I sewed around it to give an older look. I then inked it all with Chestnut Roan. Bo Bunny also had a page of die cuts which I used as the background for her little photo. While I was in Waxahachie, Texas, at The Crafty Scrapper, I found the little pocket watch piece. 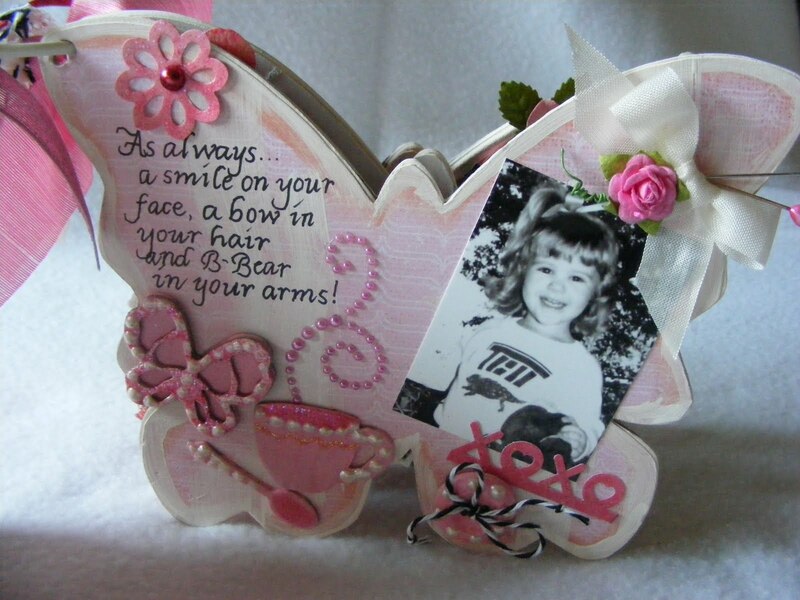 I then found from KaiserCraft the little photo to place her today picture. I used Brown dabber, then I dry brushed it with Making Memories celery green and gold paint. I loved doing this for it really shows off the photos. On the pocket watch I added a butterfly, leaf, cherub, and a curly q!! I also cut out a small piece of paper and inked it and placed on it as well. I was given the ribbon (wish I knew who made it) and added orange pearls from EK Success. The flowers are Prima. 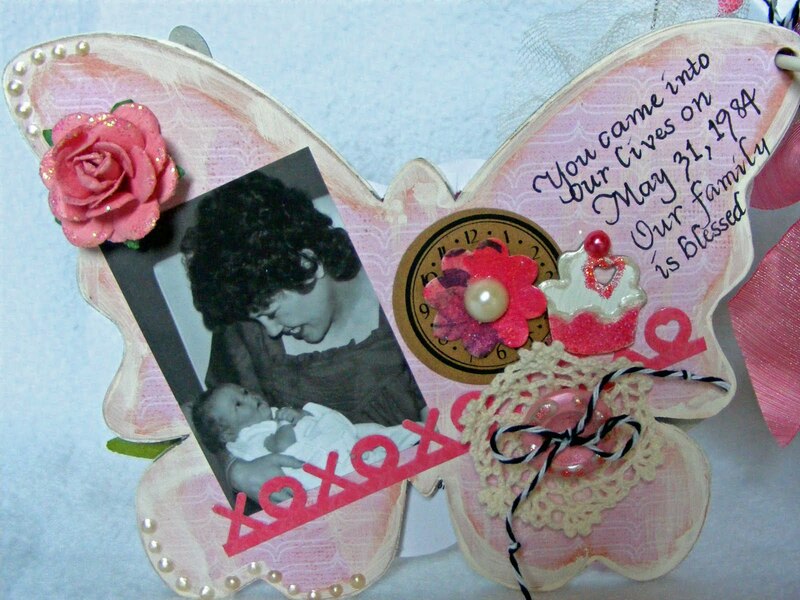 I then added "Louise" and little butterflies that I have had for some time. Materials Used: Bo Bunny Et Cetera Stampled paper, Bo Bunny Et Cetera Geography, and Die cut paper.